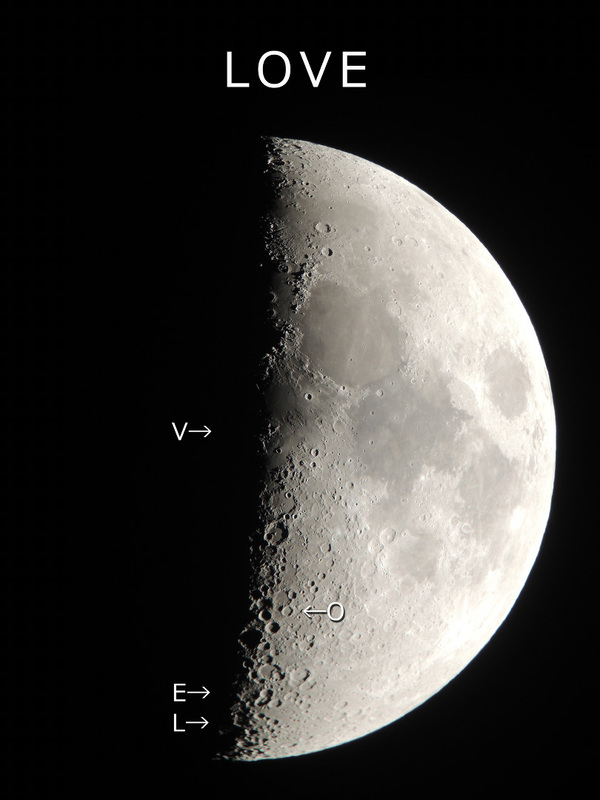 Explanation: A more creative search by a group of amateur astronomers in the Ehime Prefecture of Shikoku Island, Japan has found lunar L-O-V-E. Their secret was an examination of this sharp image of the First Quarter Moon. To discover it for yourself you'll need to look closely at details of the shadow and light along the terminator, the line between lunar night and day Created by the contrast of shadowed crater floors with sunlit walls and ridges, the letter V is not too hard to find near the center of the image. Letters L and E are a bit more challenging though, but can be teased out of shadow and light along the terminator at the bottom. Of course, on the cratered surface of the Moon the O is easy ... . Moonwatchers on planet Earth should understand that like the famous lunar X, also seen here, these lunar letters are transient and only appear along the terminator in the hours around the Moon's first quarter phase. So your next chance for lunar L-O-V-E is the first quarter Moon on November 15. Divorcées can gaze at the Moon and find X-LOVE! Well, there is a sharp "L" near the bottom of the terminator, and there is a very obvious "V" about halfway up, and you can pick any crater you want for the "O". But for the life of me, I can's spot the "E". 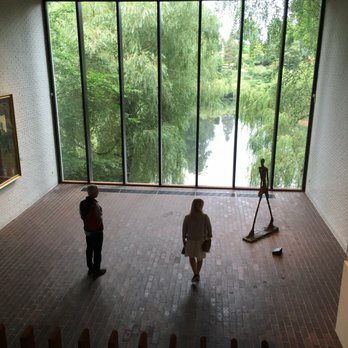 Louisiana, the museum of modern art in Denmark. Man-made tracks on the Moon in a picture from the recent exhibition. I visited the museum of modern art, Louisiana, in Humlebæk in Denmark the other day and saw their great exhibition on the Moon in art and science. 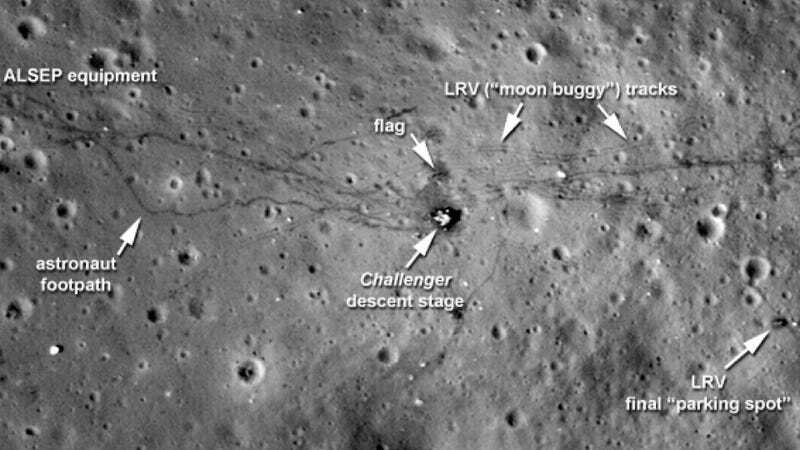 I think that my favorite image from that exhibition was the picture of man-made tracks on the Moon. Ann wrote: But for the life of me, I can't spot the "E". Ann, hover your mouse over the page. The 'E' is just slightly above the 'L', except that it is upside down. Instead look for a 'W' with a straight line bottom. Draw an imaginary line from between the letters O and V and the top of the page (the actual printed letters) and you'll find a heart shape. And, when the sun is just right, you can see dragons in clouds. And sometimes Jesus on toast. If you hover your cursor over the photo, APOD shows you where the letters are. Revolve, Evolve, Volvo. Proof that the moon is made from leftover alphabet soup. I guess that Moon rover ought to have been a Volvo! Ik VOEL me niet zo goed. Florentijn Hofman's giant Moon Rabbit in Taoyuan, Taiwan. 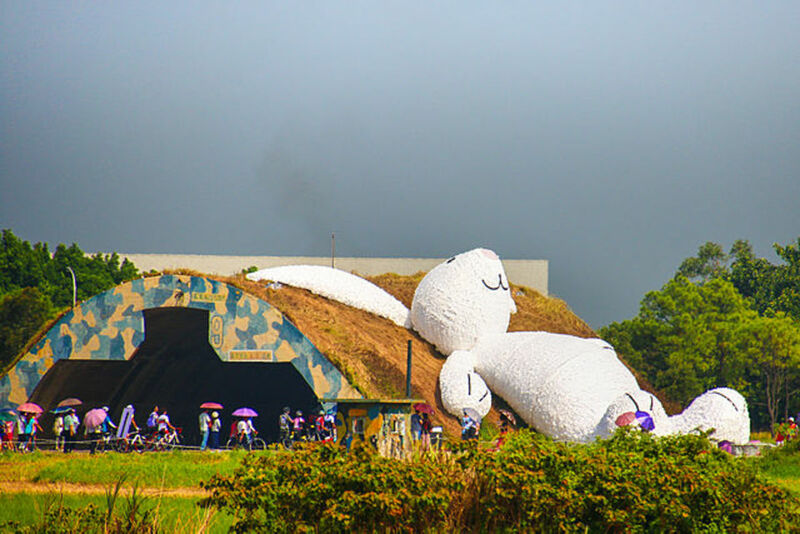 <<In 2014, Dutch artist Florentijn Hofman created a giant moon rabbit that went on display in Taiwan at the Taoyuan Land Arts Festival. Hofman - who is famous for his mega-sized rubber duck that skirted the coast of China and made its way across the straits of Taiwan in 2013 - created the rabbit out of 12,000 pieces of Tyvek and left it on the side of a bunker at the former naval base where the art festival was held. With the breeze blowing its "fur" and lying on the bunker, the rabbit looked as if it was staring at the clouds in the sky and daydreaming. The English do-construction! Other languages don't use it, and don't get it! And we don't drop our aitches, either!